In 1936, a lab assistant of the famous Bombay Talkies was called by the Studio head Himanshu Rai to appear as a hero in their next production. His name was suggested under extra-ordinary circumstances by his brother-in-law and one of the assistants of Himanshu Rai – Sashadhar Mukherjee. Kumudlal Ganguly – who would soon become famous as Ashok Kumar – was of course more than happy but could not act at all in initial few takes. In a Bengali autobiography (told to a journalist of Aajkal newspaper), Jeevan Naiyya – named after this debut film – he recalled how he was completely overwhelmed by the heroine. The heroine in question was none other than the leading lady of Bombay Talkies - Devika Rani. The last minute change in casting was due to marital tensions between Himanshu Rai and Devika Rani. 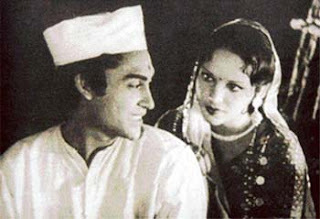 Devika Rani had eloped with the original hero of the movie Najam-ul Hasan. Himanshu managed to bring her back but decided to drop Najam from the movie. 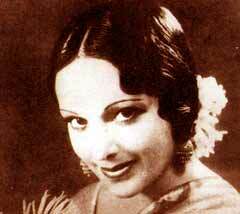 On silver screen and outside of it, Devika Rani was an extraordinary heroine. 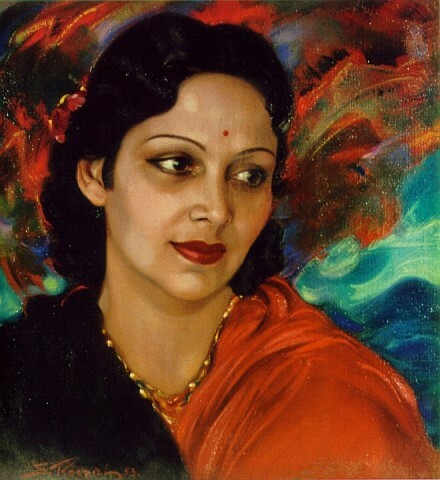 Named after the famous heroine of Bankim Chandra, Devika Rani Choudhuri was born in VIshakapattnam in 1908 in a distinguished Bengali Brahmo family. She was related to the Tagore family through her mother - her grandmother was the daughter of Rabindranath’s eldest sister. Her father M N Choudhuri was a member of the Indian Medical Service and was the first Indian Surgeon General of Madras Presidency. Her paternal uncles - Ashutosh Choudhury, Pramotho Chaudhury - were well known in the socio-cultural scene of Bengal. As a sixteen year old, Devika travelled alone to England to study architecture – perhaps the first Indian girl to have done so. She was inspired by the works of Sir Christopher Wren, who designed some of the landmark buildings of London including the St Paul’s. In London, apart from architecture, she also studied at Royal Academy of Dramatic Arts and started working in theatre and cinema production. Devika worked as an apprentice under Elizabeth Arden. Himanshu Rai – already famous as the Director of Light of Asia – requested her to design sets for his movie. Devika married Himanshu in 1929. In 1933, their production Karma with Devika as a heroine opened to a grand reception in London and elsewhere in Europe. She was invited to act in the inaugural episode of first ever BBC TV Series and was also given the distinction to make the first broadcast for BBC Short Wave Hindi Service. Himanshu Rai and Devika Rani along with their associates founded Bombay Talkies – India’s first ever stock market-listed film company, which had prominent businessmen and bankers as Directors on the Board. Bombay Talkies changed the rule of the game and soon came to dominate the Indian film industry. For all its real life drama preceding Jeevan Naiyya, it received a modest reception from the viewers. But the next movie starring Ashok Kumar and Devika Rani was to become a landmark not only for Bombay Talkies but also in the history of Indian films. Acchyut Kanya, a love story between a Brahmin boy and an untouchable girl created waves across the country. In 1940, Himanshu passed away and widowed Devika had to fight with Sashadhar Mukherjee and others for the control of Bombay Talkies. In 1943, Sashadhar and his associates left Bombay Talkies to start Filmistan Studio. It was during this phase, that she came to be known as the Dragon lady. As the head of Bombay Talkies she “discovered” actors like Dilip Kumar and Madhubala. After Sashadhar and other left, Bombay Talkies gradually faded in importance. In 1945, Devika married Russian painter Svetoslav Roerich and left Bombay and the world of movies. Thus began another, quieter phase of her life. She lived with her husband in a sprawling estate in Bangalore till her death in 1994. Apart from numerous other honours, she was given the first Dadasaheb Phalke Award for her life time contribution to Indian Cinema in 1970.